Last night, Leonardo DiCaprio accepted his first Best Actor Oscar award. He used his moment at the podium to remind us about the planet’s most urgent threat: rapid climate change. His message was timely. Just a month ago, on February 2, 2016, an article published in Antarctic Science, an online journal published by Cambridge University Press, reported that an estimated 150,000 Adelie penguins had died after a massive iceberg grounded near their breeding colony at Cape Denison in East Antarctica. By blocking their access to the ocean, the presence of the iceberg forced the penguins to walk more than 37 miles to find food. Thousands of them didn’t make it. Another reason DiCaprio’s comments were opportune is that this week we will acknowledge UN World Wildlife Day, declared by the United Nations General Assembly. The day will commemorate March 3, the day of signature of the Convention on International Trade in Endangered Species of Wild Fauna and Flora (CITES), and is meant to raise awareness about the world’s wild animals and the threats they face—a large proportion of which relates to the rapid warming of our world. The iceberg that killed so many penguins is known as B09B. It measures 60 miles long by 19 miles wide (approximately the size of Rhode Island) and grounded in Commonwealth Bay in East Antarctica in December 2010. For 20 years, B09B had been floating around the coast before crashing into the Mertz Glacier ice tongue and getting stuck. 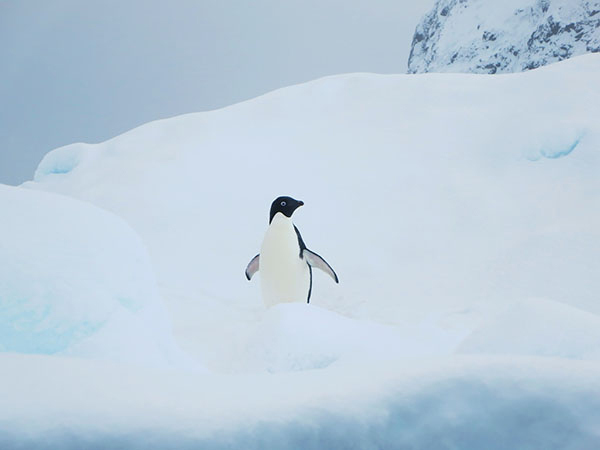 According to the article’s authors—scientists from Australia’s University of New South Wales’ Climate Change Research Center and New Zealand’s West Coast Penguin Trust—the Adelie penguin population at the bay’s Cape Denison was thought to number about 160,000 in February 2011. By December 2013, it had plunged to an estimated 10,000. The colony could be extirpated within 20 years, unless B09B relocates or the now-perennial fast ice within the bay breaks out. But while this colony is on the verge of collapse, there are other penguin colonies that are actually increasing because of the more extended ice. In fact, an Adelie population on the eastern fringe of Commonwealth Bay just five miles from the fast-ice edge is thriving. And that’s not only where things get complicated—and counterintuitive. You would think that the world’s warming air and water temperatures would uniformly cause a loss of sea ice all over the planet. While it is decreasing in the Arctic, it’s increasing around the Antarctic continent. A common misconception—often used by climate change deniers—is that it’s growing because Antarctica must be getting cooler. In reality, the Southern Ocean surrounding Antarctica has been warming—even though during the same period sea ice has been increasing. From 1955 to 1995, the world’s oceans have been warming at 0.1 degree Celsius per decade. In contrast, the Southern Ocean (specifically the region where Antarctic sea ice forms) has been warming at 0.17 degree Celsius per decade. So, not only is the Southern Ocean warming, it’s warming faster than the global trend. 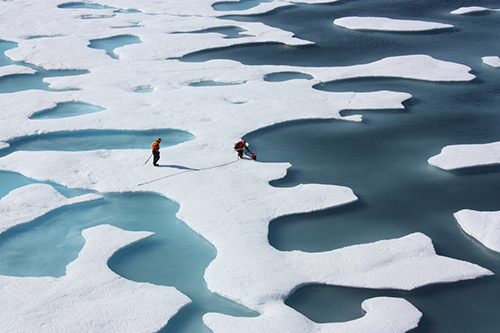 Why, then, is sea ice increasing? For several reasons, say scientists. For one, a hole in the ozone layer above the South Pole has caused cooling in the stratosphere. That causes cyclonic winds that circle Antarctica to strengthen. Those winds, then, push the sea ice around, creating areas of open water known as polynyas. 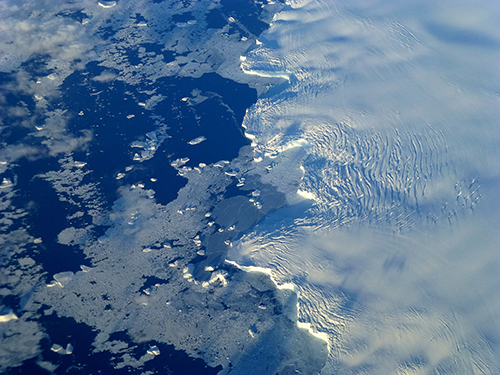 More polynyas lead to increased sea ice production. Changes in ocean circulation are also having an effect. The Southern Ocean consists of a layer of cold water near the surface and a layer of warmer water below. Water from the warm layer rises up to the surface, melting sea ice as it does so. However, as air temperatures warm, the amount of rain and snowfall also increases. This freshens the surface waters, leading to a surface layer that is less dense than the saltier, warmer water below. The layers become more stratified, and less mixing occurs. 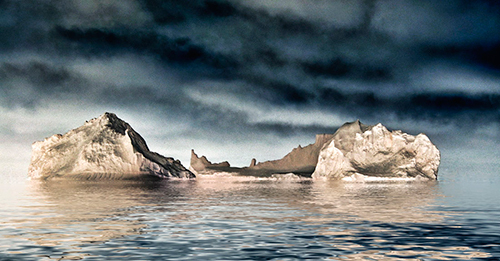 Less heat is transported upwards from the deeper, warmer layer; and, thus, less sea ice is melted. As you can see, the simplistic interpretation that increasing Antarctic sea ice is proof that climate change isn’t real doesn’t, well, hold water. The whole picture is complex and hard to grasp. For more explanation, watch the video posted below. As we approach World Wildlife Day this week, I hope that we connect the dots from the real and dangerous threat of rapid climate change to how the world’s wildlife can be expected to fare in the near future. Penguins are just one example. Leonardo DiCaprio, I’m happy you won an award last night. Thanks for placing the spotlight during your winning moment on a matter of such import for every living being on Earth. Saw the “Revenant ” yesterday. The thread of living in harmony with nature and basic filial love runs through all that violence. Right now I think the concentration is much more on wildlife, but we should also realise that we are getting indications that we will be as seriously affected.